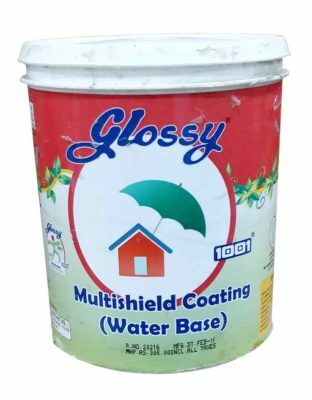 Topcoat: Apply 2-3 coats by diluting one litre of Glossy Paints Multishield Coatin gwith maximum 400ml. of water. A gap of 4-6 hours should be given between two coats. Apply one coat additional on horizontal surfaces like parapets and ledges of windows for extra protection. Provides very good protection against fungus and algae on stone & brick work.